Robots do the menial tasks, the high precision tasks and all of the tasks humans just don’t want to do…only there’s nothing really left for humans to do (well, besides highly specific and creative tasks). But lately, there’s been a push to grant robots creativitythrough a rudimentary system and soon, the world begins pushing back. To keep my review succinct, I will focus on the two things that stood out to me the most: The characters and the science. I absolutely freaking adored some of the side-characters. In paticular, Madeline, a foot-tall companion bot was my favorite. She was a darling through and through. The author did a great job humanizing the little companion bot and ever scene I saw her in just made my heart happy. I actually liked her more than the main characters! As a main character, she came very close to ruining the book for me. She’s just incredibly full of herself – not in the holier-than-thou way, but more of a Mary-Sue-can’t-do-anything-wrong way. I gasped out the last few notes of my big solo, belting my heart out, my arms stretched up to either side of the stage. I could feel my voice hit the back wall, and I knew I sounded breathtaking. Rebecca just absolutely excels at every single aspect of her life – she’s amazing at theater, has a promising creative writing career and manages to work science projects detailed enough for several PhD’s all while balancing her undergrad courses. In addition, Rebecca’s the smartest dumb girl I’ve ever read. While the author does not leave her flawless, the flaws that are bestowed upon precious Rebecca are the kind that are painfully obvious plants. For example, she’s an absolute genius in everything…but romance. “You’re going to boil the chicken?” he asked at last, watching me prep. When you have a direct line to the net in your brain…how do you come up with a good ol’ chicken boil for the hot-totally-not-a-date? How is boiling the chicken even an instinct?? The Science AKA well, I guess my eye-twitch is back. I did enjoy most of the futuristic aspects C.A. 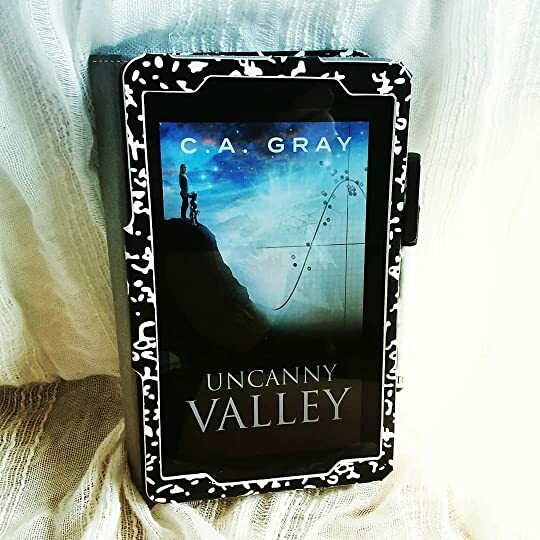 Gray added to her books – such as the robot economy, the prevalence of bots in their world, and the AI implanted in people’s brains. However, I feel like the author stretched too far. As someone who intimately knows and understands science, this book was a bust (and no, you cannot use the hand-wavy-it’s-the-fuuuuture shtick to explain away every flaw). My thesis is on the possible neuropeptide of human desire. I am not denying that undergrads can (and do!) absolutely amazing things in labs…but they are undergrads. They are not given free reign for complex neurological pathways with minor (and I do mean minor) monitoring and even if they were, what is with the vague and all-encompassing project? That is the sort of motivation you might see for an entire lab, not for one undergrad’s four-year-project. Honestly, it felt like author strung together sciency-sounding stuff whenever she talked about Rebecca’s project. I… was thinking we’d recruit people who had been through five or more years of therapy,” I whispered back, “so that they could succinctly identify their core motivations—that would be analogous to the core purpose of the bots—and also their deepest unmet desires. Then we’d design Artificial Experience scenarios in which their desires could come true, but only if they violate their core motivations. Now, if you’ve managed to read the entire word-vomit experiment, you’ll notice how…incredibly vague both her premise and her experiment seemed. It just doesn’t have the depth to make it even remotely possible – yet all of the other characters were nodding in awe. And to that, I throw up my hands. Ultimately – this book had a lot of promise and I really did love aspects (Madeline, you are literally the best robot ever!!) but I think including so much poorly-written science detail and completely (and obnoxiously) over-powering the main character took this book down a few notches.